No change in the Income Tax Slabs rate and exemption limit for Individual Person in Assessment Year 2017-18 and Financial year 2016-17.There is no change in the rate of Education Cess and Secondary 2% & Higher Education Cess 1% on . Official Income Tax of India Indusual Income Tax.Housing Laon Principal Amount Exemption and Housing Loan Intrest Deduction Income Tax 2015-16 .Educational Loan and Two Children Tuition fee Reimbursement No tax. I prepared One Model Income Tax Calculation 2017-18 financial year. 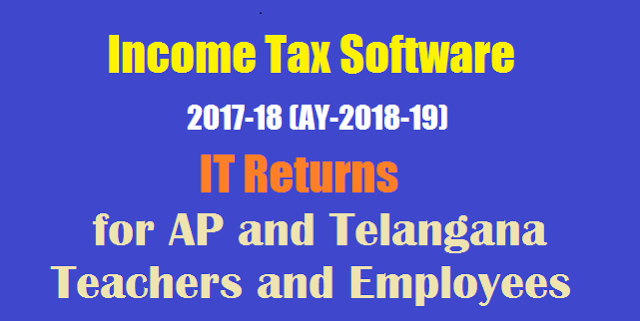 Putta Income Tax Software for AP TS Teachers 2017-18Putta Srinivas Reddy Income Tax Software 2017-18 for Telangana and AP TeachersIncome tax software2017-18 free Download for TS Teachers.Latest Putta Income Tax Calculator for FY 2017-18 [AY 2018-19] Excel Download, Income Tax Slab for FY 2017-18.